Peterborough United face an awkward FA Cup replay at National League Tranmere after a 1-1 first round draw at the ABAX Stadium today (November 4). Posh took the lead through top scorer Jack Marriott seven minutes into the second-half, but Tranmere deservedly equalised 17 minutes from time through a header from substitute Andy Cook. Idris Kanu's chance to win the game late on for Posh against Tranmere was saved by goalkeeper Scott Davies. Photo: Joe Dent/theposh.com. It was a woeful, disjointed effort from Grant McCann’s men, especially in a dismal first-half. 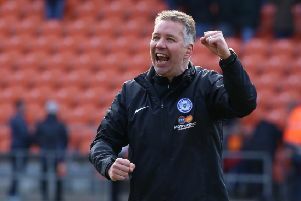 Posh changed their goalkeeper, but nothing else following their fine win over League One leaders Shrewsbury last weekend. But if manager McCann was expecting momentum to carry over he was sadly mistaken as Posh delivered a timid, slow, overly-negative display against a team over 50 places below then in English football’s lengthy ladder. Fielding five defenders - the wing-backs rarely ventured forward to any effect - was extremely cautious against neat passing, but hardly threatening opponents. Jack Marriott (centre) opens the scoring for Posh against Tranmere. Photo: Joe Dent/theposh.com. Playing Marcus Maddison and Gwion Edwards further forward than suits didn’t work either. Posh delivered two shots at goal in the opening 45 mninutes with Michael Doughty and Leo Da Silva Lopes firing well over from long range. Marriott did get in behind Tranmere’s back three early on, but he stumbled when trying to get round visiting ‘keeper Scott Davies before Ryan Tafazolli headed a Maddison free kick over the crossbar. Tranmere enjoyed more possession, but lacked penetration in the opening half, although they did come closest to scoring when 32 year-old Jeff Hughes breezed past Doughty before finding James Norwood whose deflected shot was well saved by Posh back-up ‘keeper Conor O’Malley. Posh changed formation for the second-half with Jack Baldwin operating at right-back in a four-man defence and Da Silva Lopes moving into his preferred midfield position. And Posh were in front inside seven minutes, albeit from a Maddison corner. Tafazolli’s challenge in the air was strong and Marriott pounced to claim his 11th goal of the campaign from close range. Edwards had poked wide from another excellent Maddison set piece minutes earlier. Posh then had chances to claim that crucial second goal, but a three on one was wasted by a poor pass from Marriott behind Edwards who teed up Doughty whose shot cleared the bar. And Tranmere punished those lapses when Cook headed home Jeff Hughes cross 17 minutes from time and just three minutes after entering the field of play. Posh should have been back in front immediately when Doughty’s short pass found substitute Idris Kanu free in front of goal. A poor touch enabled Davies to come out and smother the shot. And Tranmere came closest to snatching a winner late on when O’Malley reacted well to tip an Ollie Norburn shot over the crossbar. Posh: Conor O’Malley, Jack Baldwin, Steven Taylor, Ryan Tafazolli, Leo Da Silva Lopes (sub Ricky Miller, 86 mins), Michael Doughty (sub Jermaine Anderson, 79 mins), Anthony Grant, Andrew Hughes, Gwion Edwards (sub Idris Kanu, 71 mins), Marcus Maddison, Jack Marriott. Unused substitutes: Jonathan Bond, Liam Shephard, Danny Lloyd, Callum Chettle. Tranmere: Scott Davies, Liam Ridehalgh, Ritchie Sutton, Stephen McNulty, Jay McEveley, James Norwood, Connor Jennings (sub Larnell Cole, 68 mins), Ollie Norburn, Dylan Mottley-Henry, Gerry McDonagh (sub Andy Cook, 68 mins), Jeff Hughes. Unused substitutes: Paddy Wharton, Adam Burton, Jake Kirby, Mitchell Dugan, Eddie Clarke. Goals: Posh - Marriott (53 mins). Tranmere - Cook (73 mins).